Lingerie for Christmas, Delineator magazine, December 1925. Pajama pattern 6031 is lacy and ruffled, clearly for indoor wear only. I was working on these images of 1920’s pajamas when The Vintage Traveler showed this photo of 1920’s pajamas at the beach, dated 1929. 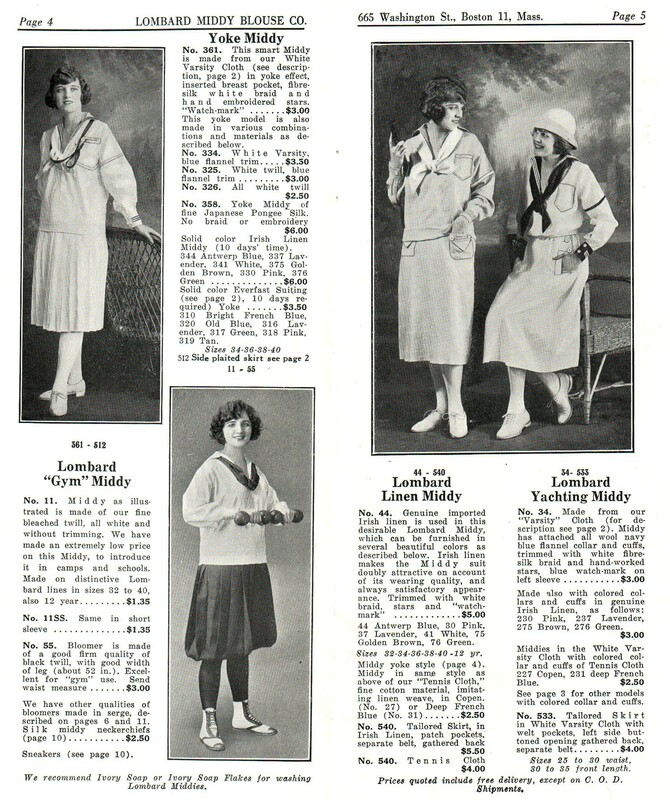 Lizzie said she is tracing the progress of pajamas from bedroom to beach in the Twenties, so this seems like a good time to share 1920’s patterns for pajamas (also spelled pyjamas) from Butterick. These are in roughly chronological order. Butterick pajamas from 1917. No. 9433 for girls or women. Below: the deep, open armholes on this pair of pajamas from 1923-24 were also seen on day dresses. Pajamas from Butterick, January 1924. Meant for lounging as well as sleeping, they have an oriental scene embroidered on the front; the pajamas have pockets, with contrasting bands at the top, the hem, and at the pants’ hems. Butterick 4639, illustrated among Christmas gifts in January 1924. These seem to have a close relationship — except for the delicate fabric — to the beach pajamas of 1929. Below: a pair of PJ’s from 1924 is banded with lace — for a bride’s trousseau. Butterick pajama pattern 5309, June 1924. The trousers expose her ankles. Below: strictly practical — but attractive, with contrasting collar and frog closings — are these pajamas for girls. Butterick 5388, pajamas for girls aged 4 to 15; August 1924. Much younger children might wear warm, one-piece night-drawers/pajamas with optional hood. Night-drawers, Butterick 5506, for children 1 to 12. 1924. Girls’ tw0-piece pajamas, Butterick 5529, from October, 1924. Pajamas for girls 4 to 15 years old. Glamorous lounging pajamas by Molyneux; couture sketched for Delineator, January 1925. “Pajamas are smart for sleeping garments, or for the southern beaches.” Butterick 5948, April, 1925. 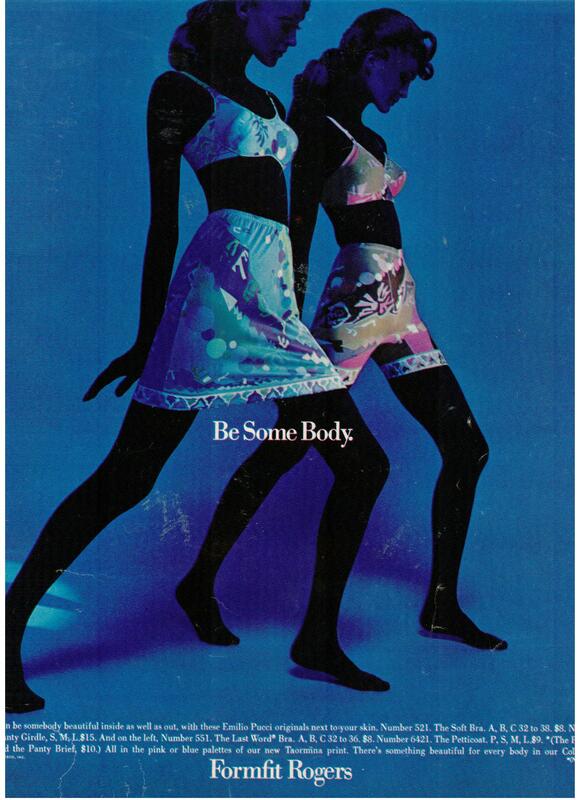 Here, Butterick pajama pattern 5948 is shown with satin bindings — sleeves, collar, and cuffs. The beach pajamas in The Vintage Traveler’s 1929 photograph appear to have satin binding at the hip and print binding at the ankles. The Vintage Traveler found this picture, dated 1929, which shows beach pyjamas very similar to Butterick 5948, although I don’t see any pockets, and these pants are banded with the print fabric instead of the solid, shiny fabric used at the hip [and collar?] Photo used with permission. I don’t think they were made using Butterick pattern 5948, but, if I had Butterick 5948, I could make those beach pajamas. Pajamas from Butterick: left, a lace-free version of pajamas 6031; center, pajama negligee 6093. Right: negligee 6107. Delineator, June 1925. Mid-twenties’ pajamas stop inches above the ankle. TwoNerdyHistoryGirls blogged about a painting of an 18th c. lady receiving a visitor while finishing her toilette. She wears a short, sheer combing gown (which gave us the word “peignoir.”) Peignoir, negligee, lingerie, boudoir — my, we owe a lot of words to the French! “Pajama negligee” No. 6093 appeared more than once. Butterick 6093, the pajama negligee, left; and pajamas 6178, right. Illustration from September, 1925. “Negligee” can mean a short robe. One thing all these straight-legged pajamas have in common is their ankle-baring hems. Butterick pajama-negligee 6093 in a short-sleeved summer version. July 1925. Here, a luxurious, lacy version of pajama 6031 is suggested as a Christmas gift. Lingerie for Christmas, Delineator magazine, December 1925. In this version, pajama pattern 6031 is lacy and ruffled, clearly for indoor wear only. Pajama 6947 is scalloped, with gathered ankles trimmed in Valenciennes lace — Not for the beach. July 1926. Butterick pajamas 6975, and child’s night-drawers, 6993. August 1926. Is it just the pattern of rectangles that gives “lounging-robe” 6975 such a wonderful twenties’ flavor? Maybe it’s the low pocket placement, too. A sketch of Molyneux’ luxurious velvet and chiffon pajamas for entertaining at home. 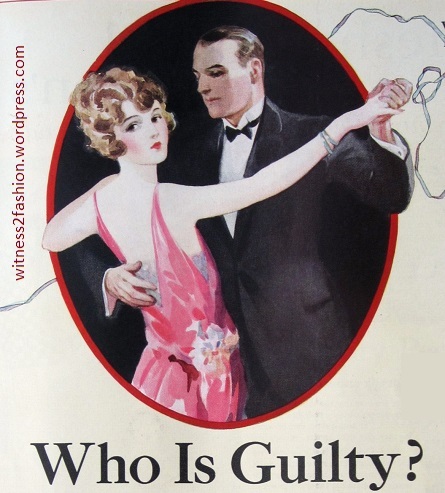 Delineator, November 1927. In black chiffon and vermillion [red-orange] velvet, with [vermillion?] poppies and green leaf embroidery. The ankles are unusual. These ready-to-wear pajamas have the more customary banded ankles. Carter’s rayon knit pajamas, in an ad from November 1927. 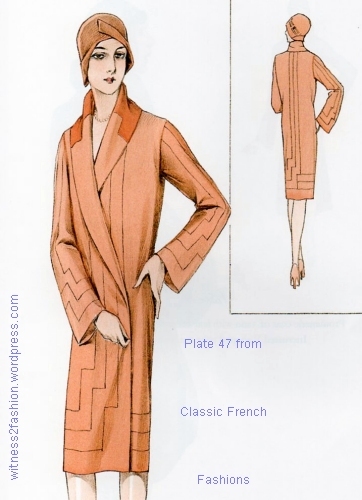 Butterick pajama pattern 2143 was featured in the December 1928 issue. The pajamas are powder blue, trimmed in apple green — another unexpected 1920’s color combination. A different Butterick pajama pattern was the centerpiece of an advertisement for Belding’s fabrics in September 1928. So: “negligee pajamas” were for lounging, and did not necessarily have the robe-like top of pajama-negligee 6093. This three-piece lounging ensemble of pajamas and short robe was featured in the December 1928 issue of Delineator. They have “wide trousers” –something new. My collection of images from 1929 and 1930 is not complete. I need to get back to the library, because, by 1931, pajamas had moved from boudoir to beach and even to public dances. “Fascinating Pajamas,” Delineator, August 1931. For lounging, leisure, loafing or working. Second from the left is a special slip to wear under your pajamas. For more about 1930’s pajamas, see The Fascinating Pajama, 1931. The pajamas for dancing are on the right. Delineator, August, 1931. Filet lace on a camisole, Delineator, April 1917. The same yoke could be used on a nightgown. There seems to have been a fashion for lingerie trimmed with this crocheted lace during the First World War era. “Filet lace” is often recognizable by characteristic grid patterns, although quite complex shapes, such as butterflies and flowers, can be created. I know nothing about crochet and very little about lace, but I’ll post these images for those who do have an interest, especially since it may help to date vintage items. Filet lace crochet. Top, a collar; left, a camisole; and lower right, an underwear bag decorated with swimming ducks. Delineator, June 1917. A camisole trimmed with a basket of flowers. Filet lace, Delineator, December 1917. Nightgowns might have a simple crochet lace yoke or a crocheted yoke that includes sleeves. Butterick patterns 8140 and 8552 from Delineator, August 1917. Filet lace trims a nightgown and a combination, Delineator, February 1917. This vintage nightgown has a simple (see-through) yoke, but the gown is trimmed with patterned crochet lace. Lace collars pictured in Delineator, September 1917. This blouse from a Bedell catalog ad has filet pattern lace, including inset medallions: Ladies’ Home Journal, October 1917. An apron trimmed with filet lace, Ladies’ Home Journal, August 1917. This fancy item was suggested as something that could be sold at a charity bazaar. A baby cap in filet crochet from a page of needlework projects. Ads for needlework supplies often ran alongside these articles. Delineator, March 1917. 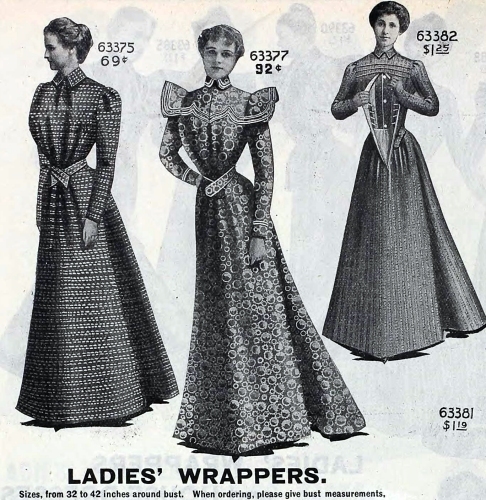 Lace-trimmed jabots were also popular circa 1917. Geometric, grid-based filet lace was not limited to the nineteen-teens; this spectacular display decorates the front and back of a slip that shows 1920’s styling. This slip, circa 1920-1925, has a large amount of filet lace both front and back. It has 1920’s style hip accents, and its length indicates early twenties. The original silk ribbon inserted in the shoulder straps and top of the yoke has a floral pattern woven into it. It’s possible that the large piece of lace is machine made, but the straps are crocheted. Filet lace was often pictured along with other forms of lingerie lace trim. Lingerie lace featured in Delineator, August 1917. Readers could write for the instructions. 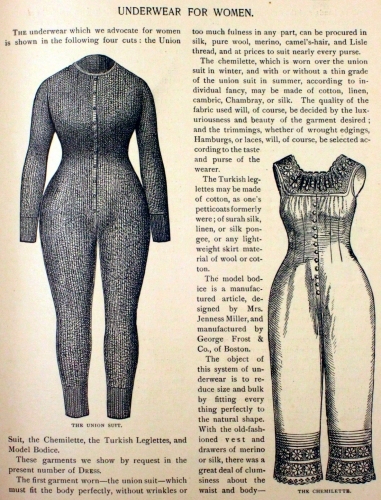 Lingerie and insertion lace featured in Delineator, February 1917. P.S. Happy holidays to all!